Every year in november, Dutch Saint Nicolas, ‘Sint’ or ‘Sinterklaas’ arrives by steam boat with his helpers the Black Petes ‘Zwarte Piet’. The boat is full of presents that they will put in children’s shoes at night. December 5 is the big feast of Sinterklaas. Sinterklaas is traditional Dutch feast. The American Santa Claus is based on the Dutch Santa: Sinterklaas, a legendary bishop who performed miracles. Nobody knows if Santa ever really existed. Fact is in the 8th century, people came up with the story of a generous bishop named Nicolas, who performed a series of miracles. Nicolas lived in what is now Turkey around 280. Nicolas died on December 6th and was buried in Myro (Turkey) originally, but later transported to Bari, Italy in 1807, where a church was built for him. Today still many people visit his grave. It is said the water that flows from his grave can perform miracles. In the 13th century people in The Netherlands started to commemorate Saint Nicolas by donating food to poor children on December 6th (the day he died, and not, as we say in Holland his birthday). Later, the generosity of Nicolas was celebrated by children being allowed ‘to put up a shoe beneath the chimney’. Saint Nicolas (Sint Nicolaas) would then put coins in the shoe during the night. Many new traditions soon followed, with special delicacies, baked goods, markets and fun fairs. It was only celebrated in big cities at first. Calvinists tried to ban the festivities of Saint Nicolas (Sinterklaas), because it was considered a pagan, or catholic feast. Like pagan god Odin who rode the 8-legged Sleipnir trough the air, Sinterklaas rode a white horse. Around 1750 and 1850, the adults started to use Sinterklaas to threaten and punish children. The feast was used as a way to brings morals to children, threatening them that they would not receive gifts if they didn’t behave or having Sinterklaas punishing them if they didn’t obey their parents. After 1945, Sinterklaas became a lot nicer, giving presents to everyone, bad children as well and also to grown-ups. Sinterklaas has become a national tradition in Holland. In The Netherlands we call him Sinterklaas, Sint, Sint Nicolaas or The Good Saint (De Goede Sint). Sint arrives with his bunch of Black Petes on a steam boat from Spain in mid-November. Children and their parents head off to the port in their local town to witness the arrival of Sint or watch the ‘official national’ event (in different city each year) on television. 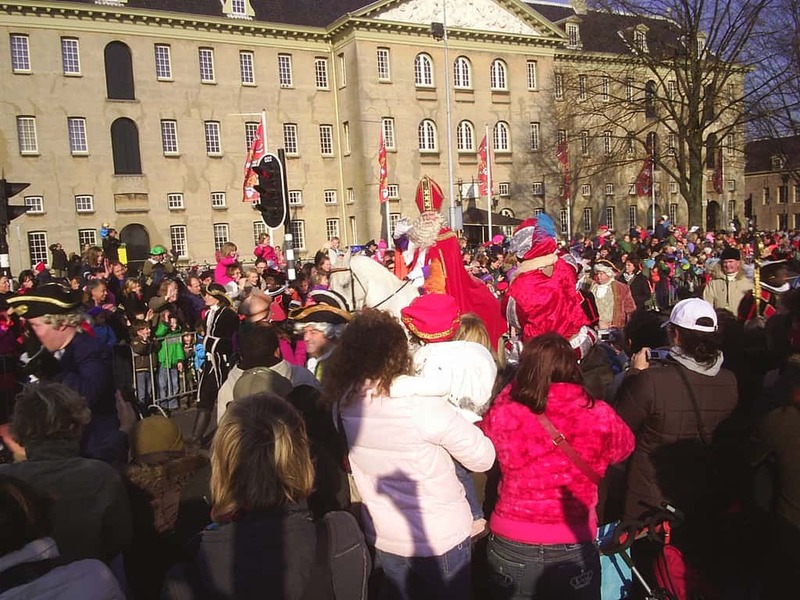 Sint tours the city on his horse, while the Pieten -his helpers, interact with the children, handing out special biscuits, such as ‘pepernoten‘. During the televised national event, there is always some (staged) major problem during the Sint’s arrival (oh, no! they forgot to bring all the presents!). Most of the time it’s Piet‘s fault. In the evening, children ‘set’ their shoe and put a letter or a wish list in for Sint and a carrot for his horse. During the night, Sint rides his white horse on the rooftops together with his helper Black Pete (Zwarte Piet), throwing down little presents or chocolate in the children’s shoes. The ‘eve of Sinterklaas’ (Avond van Sinterklaas) is on December 5th. Sometimes Sint himself pays a visit to the house, with the children all gathered. Children sit on his knee (if they are not afraid) and Sint asks if the child has been good this year. Then he reads them from The Big Red Book. All the answers are in the red book and Sint knows everything about every child in the whole country. He then gives them a present. Grown ups generally have what is called ‘surpise‘. Some weeks before they draw names from a hat and you have to make a ‘surprise’, some handmade present, that has something to do with that person, preferable something embarrassing. With it, there is a poem about this person, again with some moral, always signed ‘Sint en Piet’. Inside the ‘surprise’ is a present. This tradition is sometimes also carried out at work, with colleagues, or among groups of friends. Dutch immigrants brought the tradition of Sinter Klaas to New York in the 17th century. Over the centuries, the American Sinter Klaas became Santa Claus, a bearded, happy man dressed in a red jacket who lives on the North Pole, bringing gifts for kids for Christmas. Black Pete is Sinterklaas’ companion. Acrobatic as he is, he climbs down the chimneys to deliver the presents to the children. At first there was only one Zwarte Piet. Later someone decided it would be fun if they were a whole bunch of them. And now there is. They are all called Piet, but they have different functions: direction-Piet, gift-wrapper-Piet etcetera. Zwarte Piet is dressed in a traditional page costume from the 16th, 17th century. There are many theories about the background of Zwarte Piet. Some believe that Sinterklaas, sailing the seas from Spain brought with him a Morish helper. Here, Sinterklaas is the good saint and Zwarte Piet is the devil: good vs evil. The good vs evil story is still clearly visible in Austrian tradition where Krampus, Sinterklaas’ helper is a really scary monster, dragging chains around as he marches loudly trough the streets. If you have behaved badly, Piet would take you into his big brown bag and take you on the boat to Spain, where you would have to work hard for Sinterklaas, depicted as some kind of dictator. Until astonishingly late (mid 20th century) Zwarte Piet was depicted a a little dumb, speaking with an strong African accent. Later this changed to Zwarte Piet being the more intelligent assistant and Sinterklaas the somewhat absent-minded old man. In this day and age, according to many people, Dutch Black Pete is racist. Every year there is a discussion on how to carry on with this tradition. Emotions run high on both sides. No longer should Zwarte Piet speak with an African accent, nor wear large golden earrings. Some believe it would be better if Zwarte Piet would have his face not just painted black, but in all colours. Dutch cities decide for themselves what colour their Zwarte Pieten are. For the arrival of Sinterklaas in Amsterdam in 2018, Black Pete is no longer black faced, but just smeared with black grease because he climbs down chimneys.